stronauts’ footprints remain unchanged on the moon’s surface. They should last at least 10 million years. Age: 4.5 billion years old. Family: Satellite of Earth; member of our solar system; excellent celestial night-light. Active Relationships: Orbits Earth; affects animals and humankind dispassionately. Distance from Earth: 384,467 km (~364,397 km at perigee, ~406,731 km at apogee). Traveling to the moon by bike: 875 days. Traveling to the moon by car: 130 days. Traveling to the moon by rocket: 13 hours. Traveling to the moon at light speed: 1.52 sec. Diameter: 3,476 km (1/4 of Earth’s). Driving around the moon in a car: 4 days. Riding around the moon on a bike: 27 days. Gravity acceleration: 1.62m/sec2 (1/6 of Earth’s). Mean synodic period (new moon to new moon): 29.530588861 days. Mean orbital velocity: 1.023 km/sec. It’s good to note that the same side of the moon always faces Earth. The moon’s rotation period is synchronous with its revolution period around Earth. Whoa. Because of a loss of orbital energy to gravity from Earth, the moon is very gradually moving away from us, but don’t worry; you and I won’t live long enough to see it float away completely. In the very early history of Earth, the moon looked about three times larger in apparent size in the sky because it was closer. That means even way back then, the moon looked good up there in the sky when it was full. Because of its weak gravity, the moon has almost no atmosphere. All types of gas escapes from its surface. Without an atmosphere, there is no wind or water erosion on the moon. Yes, you read that right: there are no headwinds or tailwinds on the moon. Also, the moon’s surface is about the same now as it was three billion years ago. That’s a long time, but also, not really, depending on your outlook. Astronauts’ footprints remain unchanged on the moon’s surface, did you know that? They should last at least 10 million years. So would your tire tracks if you rode your singlespeed on the moon. The surface temperature of the moon fluctuates from roughly +300° F during the two-week daytime to -270° F during the two-week nighttime. (So please, dress appropriately.) This is because there is not enough atmosphere to keep the moon warm at night, nor protect it from the sun’s rays during the day. An astronaut’s suit is the most appropriate outer layer. Or, a nice wool jacket. And maybe a stocking cap. The volume of Earth’s moon is the same as the volume of the Pacific Ocean. The Pacific is a much scarier ocean than the Atlantic, don’t you think? The moon has no global magnetic field. That means you cannot use a compass to find your direction on the moon. Good luck with that. A quarter moon and a half moon are the same thing. 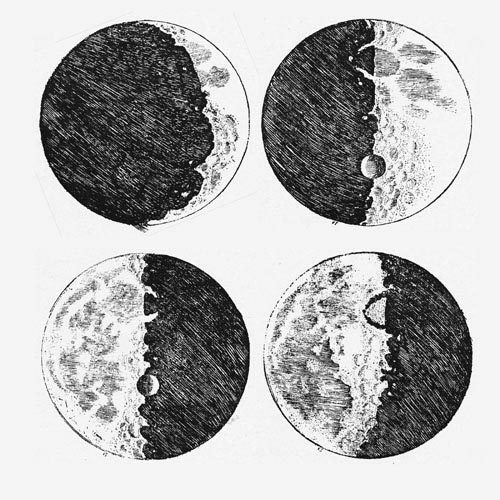 The quarter refers to the fraction of the lunar month that has passed, whilst the half describes the portion of the moon’s disc that is visible to us. We always get that mixed up, so don’t feel bad if you do, too. The moon causes many of the tides in Earth’s oceans. This is due to the force of gravity between the two celestial bodies. The sound of seagulls is a charming, relaxing sound. Though several flags of the United States have been symbolically planted on the moon, the U.S. government makes no claim to any part of the moon’s surface, which is surprising, since they often lay claim to a lot of land that isn’t theirs. The U.S. is party to the Outer Space Treaty, which places the moon under the same jurisdiction as international waters. (Don’t forget that pirates hang out in international waters because it’s lawless there). Several individuals have made claims to the moon in whole or in part, though none of these claims are generally considered credible. We just like to ride bikes while the moon is full and bright. Join us.